Are your members ready for retirement? It’s a practical, hands-on, interactive pre-retirement workshop, designed and delivered by retired workers. Our goal is to share what we’ve learned with recent retirees, and those who plan to retire in the near future. • Our course is completely flexible. It is designed to integrate with your union's pre-retirement courses, complement your regular meetings, or to stand on its own. 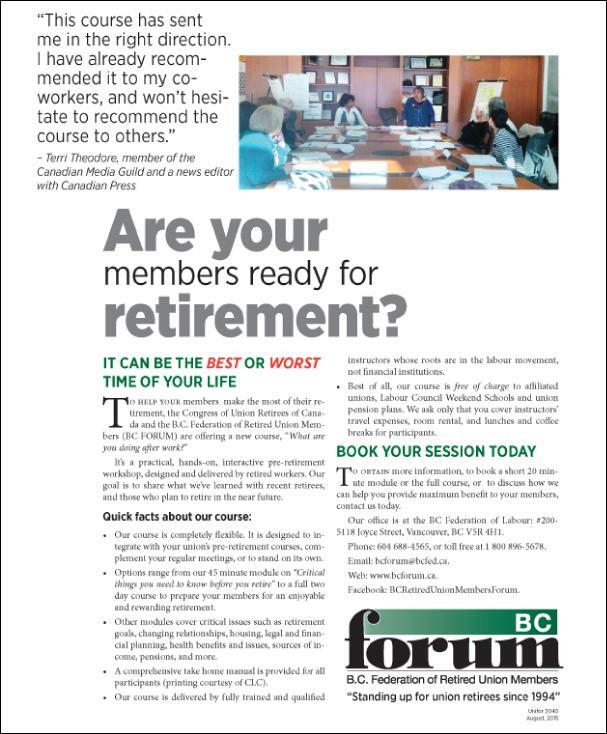 • Options range from our 45 minute module on “Critical Things You Need to Know Before You Retire” to a full two day course to prepare your members for an enjoyable and rewarding retirement. • Other modules cover critical issues such as retirement goals, changing relationships, housing, legal and financial planning, health benefits and issues, sources of income, pensions and more. • A comprehensive take home manual is provided for all participants (courtesy of CLC). • Our course is delivered by fully trained and qualified instructors whose roots are in the labour movement, not financial institutions. • Best of all, our course is free of charge to affiliated unions, Labour Council Weekend Schools and union pension plans. We ask only that you cover instructor's travel expenses, room rental, and lunches and coffee breaks for participants. To obtain more information, to book a short 20 minute module or the full course, or to discuss how we can help you provide maximum benefit to your members, contact us today.